One of my favourite feel good clothes has to be something from Agent Provocateur – the brand is known for creating drama, and the new eye catching gowns from the latest Autumn Winter 2015 collection, both floor length numbers are perfect for home – and make for spectacular evening-wear as well….the latest 2 gowns are named Cathie and Francis. The stunning ‘70s-inspired Cathie is a romantic heroine, day and night. 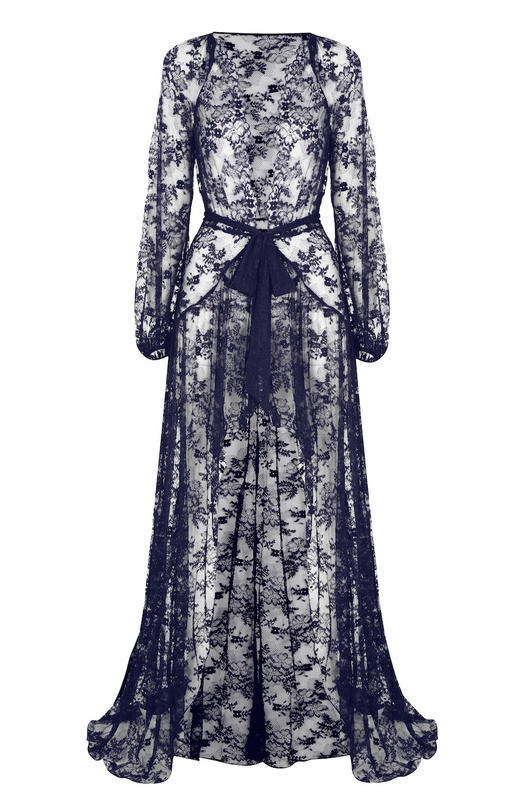 This breathtaking inspired full-length gown in seductive midnight blue all-over lace sweeps along the floor in a decadent fashion for an always-dramatic entrance, whether worn alone or as eveningwear over a cocktail dress. The long bell sleeves feature little ties at each cuff, while the gown has a curved, dropped hip seam, and ties at the waist with a bagged-out lace belt. Scallop-edged eyelash lace traces a soft pattern down the neckline, forming a keyhole cut-out across the décolletage when the gown is fastened using the hooks-and-eyes at the front neck and waist. Francis is elegant and romantic with a relaxed silhouette, also 70’s inspired, made in a flowing satin chiffon and trimmed with pearls. Step out in style in a softly sheeny oyster silk satin chiffon as Francis is graceful, and skims the floor. The wraparound gown has a tie belt and is embellished with eye-catching pearls along the low-cut neckline, around the three-quarter length cuffs, and down the edges of the draped cut-outs that run the length of each elegant sleeve. What is nice about both gowns is that they are modest and yet sensuous and something that also works for a girly pyjama party. I wouldn’t do a pillow fight in it though – more like feeling nice and soft while sipping mulled punch and sinful fruit cake while chatting with the girls till the early hours.